And A Player To Be Named Later: Is Phil Hughes A Reliever? In 1995, when Mariano Rivera was a rookie, he came to the big club from the minors as a starter. The results were mixed, to be kind. In 10 starts, batters hit .306 of Rivera and 8 HRs to the tune of a 5.94 ERA. The following year, new manager Joe Torre put Rivera in the pen. Rivera responded by striking out 130 in 107 innings with a WHIP under 1.0. The rest is history. Phil Hughes career as a starter has been mixed at best. His career ERA as a starter is 5.22, but that number doesn't tell the whole story. At times, Hughes appears to be dominating, in complete control, almost toying with hitters. At other times, he appears tentative, lost, almost afraid to use his arsenal and his prodigious talent. However, after moving to the pen earlier this season, the light has come on for Hughes. Opponents, hitting .276 off him this season as a starter, are now batting a paltry .116 off Hughes as a reliever. His ERA was a 5.45 as a starter; it's 1.38 as a reliever. But that's not all. Hughes appears more confident on the mound, more aggressive. Freed from the starter's mentality of every 5th day, Hughes seems to come into the game and unload, give everything he has and attack hitters. Hughes confidence has gone up and so has his velocity, which has touched 96, 97 since his move to the pen, up from the 92 range as a starter. And with his new found velocity and his aggressiveness, his WHIP has dropped almost a full point from 1.5 to .615. And his SO/BB ratio has gone from 2.07 to an astounding 5.33. 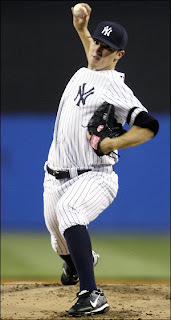 However the Yankees have stated publicly that Hughes is a starter, not a reliever. Why? Yes, I know the whole debate of starter vs. reliever and which is more valuable. And yes, a starter pitches more innings, so therefore more innings = more value. Tell that to Mariano Rivera. This year, batters hit roughly .230 off of Hughes up to his 50th pitch. After that, batters averages jump to about .300. His SO/BB walk ratio is a very good 4.40 in the first 25 pitches; it immediately drops to 1.71 in the next 25. The first time opponents see Phil Hughes in a game this year, they hit a paltry .191. The next time through; .321. The bloggers have been writing a lot about this subject; mostly to the tune of "OK, fine. But next year you put him back in the rotation." OK, maybe. Maybe Hughes is just a young guy who has to learn to develop into a starting pitcher. But maybe not. Maybe Hughes is a natural born reliever. Maybe the Yankees should play to his strengths, which, like Mariano Rivera, may fall into the reliever role. Wouldn't it be better to have a shutdown reliever in the pen—possibly a future stud closer, then a mediocre starter? To whit, out of 7 starts this season, Hughes only had 2 quality starts. Overall, I'm not saying the absolutely, without question, Phil Hughes should be in the pen. Its very possible that Hughes will develop into a fine starter. Maybe even a great one. All I'm saying is that the argument that he should absolutely be a starter shouldn't be so absolute. There is precedent. Just ask Mariano Rivera. I was kinda expecting this. Nobody is looking to immediatly put him in the pen, but having a super closer would be ok with me.